GaleWrap, Douglasville, GA, introduces the GW-4100 robotic pallet wrapper, with height-adjustable mast for easy movement throughout a warehouse. Used with GaleWrap-oriented film to eliminate load failures, the pallet wrapper offers ideal product protection and wrapping consistency, minimal waste, time and cost savings along with improved employee safety. 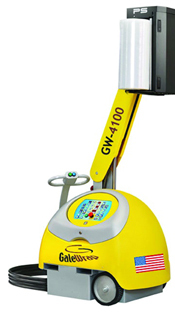 The GW-4100 handles as many as 37 loads/hr., and accommodates loads to 6 ft.-11 in. tall. Other features include an automated wrap-up/down cycle, built-in film cutter, push/pull emergency stop button and a safety contact edge. Film and tension adjusts electronically from the control panel.